Shocks and struts are an important part of your vehicle’s suspension. While you may never need to replace them, they do wear out over time and can eventually fail. Expect most shocks or struts to last anywhere from 50,000 to 100,000 miles. So what is the average cost to replace shocks and struts on your car when they go bad? Can I Replace Shocks or Struts Myself? The first thing you need to understand is the importance of the shocks and struts and why exactly you need to replace them. Most modern day vehicles have struts up front and shocks in the rear. However, some may have the same type all around. Struts are the entire suspension assembly while shocks function as part of the entire suspension. The suspension system of your car has two main functions. Vehicle Performance – First, it manages road handling, helps with braking, and minimizes body roll while cornering. All these things help assure the safety of the passengers while driving. Comfort – Secondly, a suspension system maximizes the comfort of the driver and any other passengers as it minimizes noise, vibrations, and bumps. 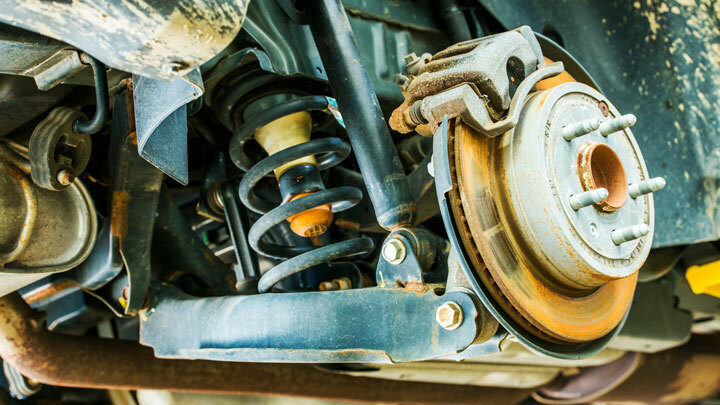 Shocks and struts play a major role in the suspension system of your vehicle, making their wear and tear have a negative impact on not just comfort, but safety. Damaged shocks and struts affect the way the car tires meet the road resulting in poor performance, dangerous swaying and body roll, poor braking, and unsteady handling and holding of the road. When replacing struts, you want to do so in pairs even if you think one of them is still good. Otherwise you can have serious handling and suspension issues that can cause unsafe driving conditions and even expensive damage. The price you’ll pay to replace struts can vary quite a bit depending on brand of struts (usually either KYB, Monroe, Gabriel, or Bilstein), the make and model of your vehicle, and where you have the strut replacement done. On average, expect to pay somewhere between $450 and $900 to replace a pair of struts. An individual strut assembly will cost about $150 to $300 so you’re looking at around $300 to $600 for parts alone. Labor alone will set you back about $150 to $300 for the pair. Going to a car dealership for a strut replacement can cost significantly more and you can almost be assured of paying at least $1,000 as a typical front strut replacement cost. For this type of service, it makes sense to shop around and ideally go with a trustworthy independent mechanic to get the best price. It is worth noting that a wheel alignment should be performed after having new struts installed. A two-wheel alignment will add another $40 to $80 and if all four struts are replaced, a four-wheel alignment ($80 to $160) is necessary. Like struts, you want to replace shocks in pairs. The cost to replace shocks is going to be slightly less than struts since they are generally not as complicated as struts. The average total cost to replace a pair of shocks will run about $250 to $580. An individual shock absorber will cost around $50 to $140 so parts alone will set you back between $100 and $280. A couple hours of labor to do the job is an additional $150 to $300. If needing to replace all 4 shocks (or struts), simply multiple the above total costs by two to get an estimate. Keep in mind that the cost for some vehicles (especially luxury vehicles like Mercedes Benz, Audi, BMW, or Lexus) will be more than average. The same applies to sports cars or other vehicles that use more advanced shock or strut assemblies. It depends. Replacement of shocks is pretty straightforward. The hardest part will be dealing with possible rust or seized bolts due to them being exposed to the elements. But you can easily save a couple hundred dollars off a typical shock replacement cost. Struts come as either individual parts or complete assemblies. If the spring is separate from the strut, a spring compressor is required to compress the spring for removal and installation. If you don’t know what you’re doing, the highly compressed spring could pop loose and cause a traumatic injury. Struts that come as assemblies are much easier to replace since the spring is part of the assembly. A pair of strut assemblies can be replaced by the average DIY mechanic in under two hours. But if the spring is separate, it’s best to let the professionals handle the replacement. Got an estimate for alternator for 9 hundred my mechanic fixed it for 4 hundred. For struts no idea depends where you go. Friend just paid 8 hundred for 2 struts with labor included. Appreciate the comment. $800 for a pair of struts sounds high but it always depends on the vehicle make/model.